Google Home Hub: a display-toting, Amazon Echo Show-rivalling smart speaker | What Hi-Fi? Google has kicked off its annual Pixel launch event by announcing a new (its fourth) smart speaker, this time with a touch display. The new Google Home Hub sits alongside the existing Google Home, Google Home Mini and Google Home Max speakers. Like Amazon’s Echo Show, the Google Home Hub has a touchscreen allowing users to not only hear responses to queries but also see them. It’s been two years since Google Home launched, and now that the company's smart speaker line-up is four products strong, Google says its working to create not only a more connected home but a more ‘thoughtful’ one. The Home Hub works like its siblings, providing the full Google Assistant voice experience, alongside music playback and smart home device control, while also introducing improved functionality and new features - thanks largely to that touchscreen. One new feature is Home View. This can be accessed with a swipe down from the top of screen and brings up a dashboard that maps out your entire smart home, giving you a visual overview of all your connected devices. For example, you can turn down a smart thermostat in one room, and turn your music up on a Google Home device in another, all on the Home Hub screen. The Google Home smartphone app has also been redesigned so that it displays the same Home View dashboard, allowing you to control your smart devices even when you aren’t at home. Elsewhere, the Google Home Hub will respond automatically to your environment thanks to ‘Ambient EQ’, which combines a dedicated sensor and Google’s own imaging algorithms to automatically fine-tune the brightness and colour of the display. A fancy way of saying it'll dim the screen in the dark, then. The YouTube experience has been optimised on Home Hub, and it will also come with six months of free YouTube Premium. Worried about privacy? When you don’t want the Hub to be listening it can be put into ‘downtime’ mode. For longer periods of downtime, it can double-up as a photo frame. With Google Photos integration, the Home Hub can display existing albums or have Google curate an album for you. If you want to get clever, you can select the people you want to see displayed in photos and Google will curate (and automatically update) a live album, using machine learning to ensure it only selects images that aren’t underexposed, blurry or duplicates. Google has chosen not to include a camera on the Home Hub, however – so wave goodbye to Skype video calling. Google said this is so the device is “comfortable to use in private spaces in your home”. 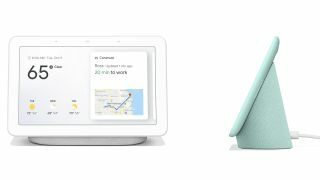 The Google Home Hub is available in four colours (grey, pink, white and turquoise) and will be available for pre-order on 22nd October for $149.